The debate for the FDA about feeding chicken litter to cows appears to stem from their concern over Mad Cow disease, which strikes me as the tail wagging the dog. So before I talk about the dog, I will address the tail. Chicken litter, i.e. everything from the floor of a chicken house, sawdust, feathers, manure, spilled feed, etc., is being fed to cows in feedlots. The FDA temporarily banned the practice in 2003 because there was concern that the chicken feed (industrial chicken feed includes “recycled cattle proteins” and “ruminant meat and bone meal” – a.k.a. beef, in its ingredients) was spilling onto the litter and being fed back to the cows. As a chicken owner, I can verify that assumption – chickens are not neat eaters. In February of 2003, a study done by the North American Rendering Industry, showed, “it will require feeding 10 pounds of poultry litter / cow / day for 6,442 days, or 17.65 years, to achieve a single ID50 dose!” The ID50 is the median infective dose for Mad Cow disease. Cows bred and fattened for industry live less than 2 years. The 17-year time frame is very compelling, and I can see why the FDA removed the chicken litter ban in their later rulings. I had never heard of the National Renderers Association before reading their study, so I did some research. Nearly 59 billion pounds of animal byproducts are recycled and reused by the rendering association annually. One third to ½ of an animal we have bred for meat is not used and the renderers turn that into “feed ingredients” as well as “valuable ingredients for various soaps, paints and varnishes, cosmetics, explosives, toothpaste, pharmaceuticals, leather, textiles and lubricants.” Renderers are an integral part of the meat industry. An association of renderers, who recycle leftover animal parts into animal food, paid for a study to show there is no harmful affect on cows eating cows (small amounts of cows). And honestly, who else has the time, inclination, or finances to run that study other than the people directly affected? Assuming we have successfully rendered (hehe) the argument against chicken litter causing Mad Cow Disease null and void, let us return to the main point – feeding chicken litter to cows. According to the North Carolina Extension service, the litter should be processed before being fed to cattle. There are several ways to process the litter, but the goal is to stack it to create conditions for bacteria to raise the temperature of the stack to 140 -160 degrees to kill pathogens present in raw litter (the main pathogen of concern being E. Coli). The University of Missouri Extension has a chart discussing the nutrient basis of chicken litter. On average the litter contains 25 percent protein, which is a fairly cheap source of food for the beef farmer. The ability to recycle the huge amounts of waste from chicken factories into feed for beef in feedlots appears to be a win-win for all involved. Cheap feed for cows translates into cheap hamburgers. Which brings us to consumer choice. Do you want to eat cows that have ruminated litter from the floor of an industrial chicken facility, or do you want to eat animals that have masticated grass and felt the warm sun? 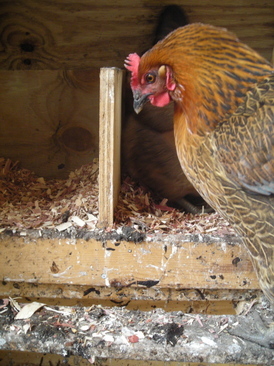 This entry was posted in On the Farm and tagged Animal Feed, Backyard chickens, Corinna Borden. Bookmark the permalink.